Thanks for visiting us at Club Thrifty! We hope you enjoy your stay. Before you leave, we’d love for you to subscribe to our blog! Thanks again for visiting, and come back soon! I wanted to take a few minutes to tell you all about my new budget-busting habit. Don’t worry, mom. It’s not crystal meth or animal hoarding! I have actually become obsessed with juicing vegetables and fruits. 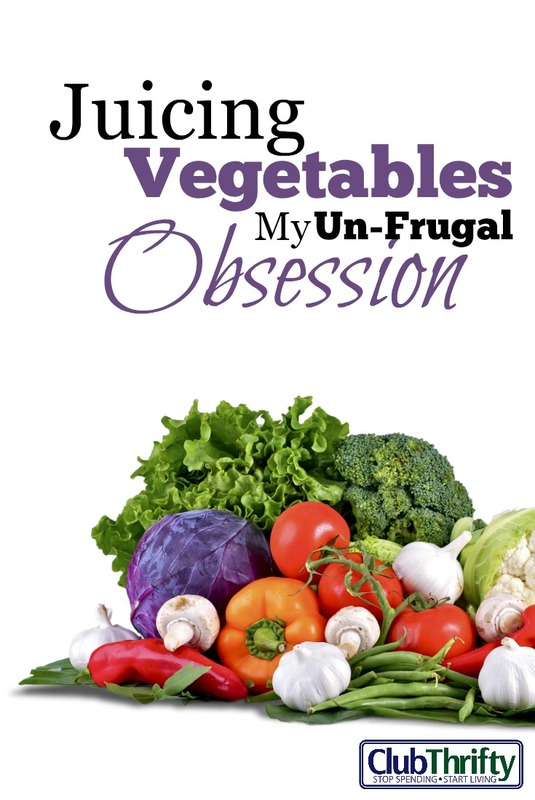 My obsession with juicing vegetables all started after Christmas when I was left with almost $200 in Kohl’s gift cards burning a hole in my pocket. Greg and I had recently gone vegetarian, and we were watching a documentary about nutrition on Netflix. During the movie, a few doctors and nutritionists chimed in on the benefits of juicing raw fruits and vegetables. I was very intrigued. Juicing looked fun. I liked watching them turn veggies into juice and I wondered what it would taste like. We decided to see if we could fit a juicer into our budget. This is when the Kohl’s gift cards came in handy. Juicers are so expensive! I shopped online to determine the brand that I wanted to buy. Ultimately decided to buy an Omega Heavy Duty Mega Mouth Juicer on sale for $179.99 (regularly priced at $249.99). This is waaaaaaaaaaay more than I would typically spend on a small appliance, but it ended up being free, so I decided to splurge. That following Saturday night, we planned a romantic evening, got a babysitter…and went and bought our juicer. After making fun of ourselves for doing something so lame on a weekend night, we stopped by the store and bought the goods. We filled our basket with cucumbers, oranges, apples, kale, and carrots. Within a few minutes of arriving home, I had the juicer washed, assembled, and ready to go. Now, I’m hooked. I’ve been juicing vegetables at least once per day…and sometimes twice per day! My favorite things to juice are cucumbers, pomegranates, and bok choy. It’s fun, easy to clean up, and delicious. I’ve found that even the nastiest tasting vegetable juice can be turned yummy just by adding an apple and half of a lemon. Best of all, both of my kids love it. There is simply no way that I could get my kids to eat the huge variety of fruits and vegetables that I juice on any given day. Sure, my kids will eat a few carrot sticks or grapes. But juicing opens up a huge variety of nutrients to their little growing bodies. I love it when my daughters drink “crazy juice,” as they call it, and have no idea what they are really consuming. I sneak all kinds of stuff in their crazy juice, including, beets, cilantro, parsley, kale, and spinach. I thought that Greg and I were going to save a ton of money when we finally decided to stop buying and eating meat. However, my new habit of juicing vegetables has eaten up any surplus money. Luckily, we are still on budget for this month, despite my fresh veggie habit. The good news is that this is probably the most expensive time of the year to juice. In warmer months, I know that I’ll be able to find fresh local produce for a fraction of the price, or even free. I know in the past there have been summers when people have so many cucumbers and tomatoes that they don’t know what to do with them. I will definitely be ready and willing to take them off people’s hands for my delicious juicing recipes! The frugal side of juicing is that I am no longer letting any fruit or vegetable leftovers go to waste. The huge broccoli stalks that I used to throw away now make an amazing juice base. Those random 8 grapes left on my daughter’s plate? They now get juiced. That half eaten carrot? It goes in the juicer. 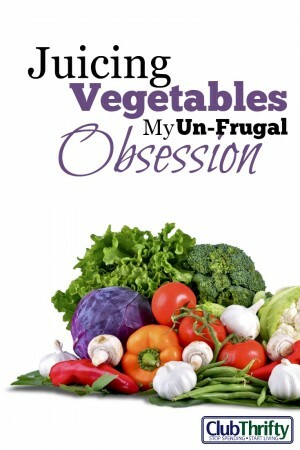 I am finding that juicing vegetables can be frugal…in a roundabout way. At least I am trying to convince myself that it is! Besides, if it keeps us healthy, that saves us money in the long run, right guys? Right?!? I’m so happy that I stumbled upon this healthy hobby. I can’t wait until it gets warmer out and I have a wider variety of fresh food to juice. I’m now officially obsessed with juicing vegetables and am really excited about the huge nutritional potential of this hobby. My three-year-old has wanted peanut butter, jelly, and carrots for dinner for the last five nights in a row. At least now I can serve her a big glass of “the good stuff” with her meal. I feel the best I have felt for years. I feel aware, healthy, and full of energy. Aside from not getting any sleep, I feel like a million bucks. I have to think that it has something to do with our meat free diet and high nutrient intake because that’s the only recent change we’ve made. ***Make sure to check out my updated post with my favorite juicing recipes!! So, what do you guys think? Do you have a juicer? Do you want one now? Let us know in the comments below! I don’t juice vegetables. Nor do I think that everything need to be frugality oriented. I do a lot of cooking at home. My cooking isn’t the frugal type either. I love meat, gourmet ingredients, and a glass of wine. And that’s okay. It’s my hobby and I invest a lot of time and effort into it. And it makes me happy. I enjoy meat too…even more now that we are going wheat free. My cholesterol has actually dropped by eliminating wheat! I feel about a million times better when I don’t eat wheat! I don’t juice vegetables but have a lot of smoothies, which I think are absolutely delicious. I would consider juicing vegetables, though, because it seems like an “easy” way to get more veggies into my diet. Totally agree! Hopefully it will make a long term difference if we keep at it. We don’t have a juicer, but my wife has mentioned wanting one in the past. Like has been said, not everything has to be frugal…plus you get some awesome side benefits to boot! Yeah, but I wish things that I want to do EVERY DAY were frugal. But so far so good. I try to juice mostly cheaper veggies and just add in a little of the more expensive stuff. This month has gone okay. Its the 23rd and I will have $83 left in my grocery budget! I have a blender to make fruit smoothies, but a juicer sounds like a lot of fun! In my supermarket there was a reduced produce aisle with fruits and veggies that has only a few days left, priced at a heavy discount. This could be a way to get cheap vegetables. Good job on zero food waste! My grocery store has clearance vegetables too- especially organic stuff because nobody seems to buy it but me. I have stated taking a closer look at it every time I go to the store! Great topic! I have a hand-me-down juicer that I’ve never tried. It’s just a cheap one, but I might give it a shot. We make a ton of smoothies, so fruit never goes to waste in our house. In fact, if I can’t use it in time, extra fruit goes into the “smoothie ziplock” in our freezer. Buying fresh produce can be spendy, but is well worth it if you use it wisely and don’t throw much (or any) out. I can definitely relate to throwing out entire stalks of broccoli, and I always have an abundance of cukes in my garden each year. Might have to consider a fancier juicer! When you were researching juicers, did you consider a high power blender like a Vitamix or Ninja instead? They are more expensive but they use the whole fruit/veggie, so even less waste. Wonder how the nutrition compares? I actually do have a smoothie blender. My kids love frozen fruit with a splash or orange juice and milk. They think its ice cream! I’m with DC: don’t do the juicing thing but love doing the smoothies. And think of the money you’ll be saving on healthcare costs! That’s gotta put you back in the black again :-). We don’t do juicing but my wife does get on a kick where she makes smoothies, which are good and flavorful and much healthier than the varieties you get from the specialty places. We do smoothies too………with the magic bullet. My mom got it for me! It makes a perfect portion size for the 4 of us! Do it Michelle! Then we can exchange recipes! Lol, no, I don’t do that kind of thing, I hardly even know what it is. But I can say this… however it works exactly, even if it costs a little bit more, if you’re eating more vegetables and fruit, then it’s probably worth it. I do smoothies just about daily, but I’ve never juiced, and the initial investment in a juicer is definitely part of the reason why. When we were looking at them, some of them were like $1500! Im sure they’re great but I think it’s crazy to spend that much! I’m big on eating veggies, but not drinking them. Generally, it’s not in my nature to judge based on the looks of food items, but for some reason, the color of some of those concoctions just doesn’t appeal to me. Just be careful with the vegetarian lifestyle because since they are primarily water, there are lots of things that vegetables don’t provide nutritionally like protein, iron, calories (which is necessary for energy production) and more. Good luck on the journey! That’s good. So what are you guys doing, just cutting out red meats or are you limiting the poultry & fish too? Greg quit eating all meat altogether. He has IBS and certain foods make him sick all the time. We think that meat was one of them because he’s feeling really good right now. I still eat eggs because I didn’t want to give those up. We aren’t really going to eat seafood BUT we are going on vacation next month to the Caribbean and I’m sure that we will end up eating some. There’s no reason to be strict about it if we don’t want to! The main thing we quit eating is poultry, red meat, and pork. So far, so good! I’ve wanted to start juicing for a long time, but I haven’t taken the punge yet. I almost bought a juicer for $30 on craigslist. Would you advise getting a brand new one? I did, but mostly because I had Kohls gift cards. If I were spending my own real money, I might have looked on craigslist! You may even find a new one that someone got as a gift and didn’t want! My only suggestion would be to buy a high quality one. I have read many reviews about cheap ones and have heard that they waste a lot of juice and dont do a great job. Hey, nothing wrong with that. At least you are eating them. Most people definitely aren’t! I suspect part of the cost is the time of year that you decided to jump in. I bet that you can do much better later in the year by buying juicing apples by the box and freezing the results, etc. Yeah, and Im sure I’ll do better in the summer when there are surplus veggies! I don’t juice, but then again, I don’t have to convince anyone in my house to eat their veggies! I have started the green smoothie thing, though, and I like it because I’m trying to increase the number of servings of veggies in my life to 9 a day, and a smoothie is a good way to make four servings into a palatable 20 ounces! Hey, it sounds like you are doing awesome Kathleen! I’ve been juicing since I was a kid. I’ve always had a juicer and a blender. I make smoothies with my blender and put all kinds of vegetables in my juicer. I also add an apple and lemon for a better taste. I recently started adding kale and spinich to my mix of vegtables. I love juicing. It’s a great way to stay healthy since it would take much longer for me to eat all those veggies and fruits. Ooh…I would love to have a juicer!! I would most likely be instantly hooked as well because I love making smoothies already. Someone might have already asked, but what is the name of the nutrition documentary? I’d love to check it out! I answered to Joe at the bottom about it! I’m not 100% sure which one we were watching that night! Look on Netflix! We don’t have cable so thats where we watch all our shows! We have to eat, so why not enjoy it? If it’s healthy too then fantastic! One can only live so long on rice and beans. (Well ok ok, you won’t die, but you won’t have “lived”). My family (2 adults and a toddler) is the BIGGEST portion of my family budget. It’s often $800+ a month. Mind you part of that has to do with where I live (in a very expensive city) and part of it has to do with the various dietary restrictions due to allergies as well as a desire to eat organics and get the additives out of our diet. I don’t say that I enjoy cooking, but I most certainly enjoy the fruits of my labours. Yes, it is definitely worth the extra effort. I don’t buy everything organic but I do try to buy the dirty dozen in organic. It’s not cheap! You can also make a game of it with the seasonal fruits and veg. Don’t forget to journal your recipes though… You’ll know combinations what to try again and what to avoid. Yeah, I haven’t been writing them down yet! I do know that I like almost anything if it has carrots and an apple in it! Oh my stars. My father currently is on a juicing kick, just like you! Every time I visit he will proudly make me a ‘power drink’, and even sneaks in bits of unconventional odds and ends, like nuts and stuff. The drinks, I admit, are different. But fabulous! I do fruit smoothies almost daily and get grumpy if I can’t make one. I’m sad to say I don’t know the difference between a blender and a juicer. Can you also make things like the base for tomato soup in a juicer? I’d love to get some veggies in there if you can make anything taste great with an apple. Yeah, you could. A juicer basically extracts the juice and a lot of the nutrients out of fruit and vegetables and leaves behind the dry pulp. Eating vegetables whole is preferable but juicing is a way to get a huge variety of different nutrients on a daily basis without eating an entire platter of stuff each day! I started juicing in September but purchased a cheap $40 juicer off Craigslist. I also love it. I feel like I get such a heaping load of vegetables every day. Isn’t it amazing? I can tell a big difference in my energy level and focus. I am not a juicer, but I used to have smoothies for a breakfast for quite a while. I use it at least once a day! What was the documentary? I’d love to watch it. I will have to ask Greg. We’ve seen several now and I think I am getting them confused. A few of them we have seen are “Vegucated” and “Fat, Sick, and Nearly Dead” I’m not sure if those are the ones we were watching that night though! I didn’t think I liked kale until somebody told me to make “kale chips.” You just rub kale with olive oil, put salt on it, and bake it for 20 minutes. Its delicious! I love kale chips, too – just made them the other day. To me they function and taste like popcorn. The first time I made them I ate the entire tray! It looked like a huge amount of food but there really isn’t much to them at all. Still, I think it’s weird that they are naturally salty. You’re right, it is kind’ve like eating popcorn! That sounds pretty good, I’ll have to try it thanks! I have also gone vegetarian but instead of juicing, I make fruit and veggie smoothies. I prefer to consume the entire fruits and veggies instead of just the juice. I also started doing this after watching health documentaries on netflix and have become obsessed! It is amazing how much it has affected my energy and health. I tried going vegan for a while and during that time I had never felt better or healthier. I had way more energy than I even had in high school! I actually saved a lot of money when I went vegan. Animal products are expensive. What I do now for smoothies is that I buy a large amount of fruits and veggies when they are on sale and freeze them. Do you remember what documentaries are on Netflix? I have seen a ton of them but am drawing a complete blank! Doesn’t juicing remove all the fiber from the food? Removing the fiber will increase the speed that the glucose from these foods hits your bloodstream, giving you a higher insulin spike than if you were eating the whole food. Personally I am concerned about developing insulin insensitivity from these large spikes, so I would make smoothies rather than juices if I want to drink produce. I suppose juicing might be better than not eating the vegetables at all (for many fruits I would say it might be worse since they are so high in sugar), but is there a way you can transition to smoothies or just eating the whole food? We do eat whole foods but the point of juicing is to get a wider variety of foods on any given day. We are each drinking about a 8 ounce glass a day… My kids are probably drinking more like 2 ounces a day. And that is the other thing, in theory it would be great if my kids would eat all the foods whole but my 1 and 3 year old wont eat kale, spinach, cucumbers, bok choy, or anything like that. Juicing makes that happen. This is why we don’t have a juicer. I *already* have insulin problems. I don’t think it would be a problem for the rest of my family though. I used to juice a lot. Those Jack Lalanne commercials got me into it. I don’t juice as much anymore because I just hate the clean up. I have tried several juicers and my favorite juicer is the Breville Juicer. Juicing is great and definitely gives you a boost of energy. It also helps with constipation :). I eat a lot of vegetables, though I am far from vegetarian. I just enjoy eating them. I have tried drinking them, but I just wasn’t fond of it. I say good for you Holly and if it costs a little more to do what you enjoy, then it is a good expense. I think so too. This month has been ok. I just dont want to start going over my grocery budget! So you’re juicin’, eh? What are you, Lance Armstrong? I love juicing in the morning. It starts my day off amazingly. Cheesy, but true. Jeff is trying the Paleo diet, which is no dairy, wheat, corn, sugar, or processed foods. I want to try, but I’m not convinced that I can do it! For lunch, I had a salad of mixed greens, avocado, tomato, hard-boiled egg, and carrots, so that’s Paleo-friendly! However, since then I’ve done quite a bit of snacking. :/ The juicer is something I would purchase if I had the money like you did. For $250, I’d be afraid I’d use it a lot at first, but then get sick of it. That would be most unfrugal. It sounds like you ate a really healthy lunch, Michelle! Sounds like you should join a CSA! My sister offered to get us one the Christmas before last, but I was pregnant with insulin problems and needed to digest more slowly rather than quicker. We do eat a lot of smoothies. Sorry for my ignorance, but what is a CSA? Basically you give money to a local farmer and get a percent of the crop. They’re generally cheaper than the grocery store and super fresh. My in-laws joined one last summer and they live in a town of 3000 people! I’ve seen a number of infommericals selling juicers, but haven’t tried one yet. I do love smoothies with bananas and strawberries though. When I juice, I bake the leftover pulp into breads or muffins! I’m glad you discovered juicing, you can make some amazing stuff! I haven’t gotten into it mainly because of the cost, although that’s no excuse because my friend has a juicer he said I can borrow any time. I do make a green monster smoothie on most days (almond milk, spinach, banana) but that’s about it for juicing. I know it can be really healthy. I have to say though, I did try one juice from whole foods (celery, cucumber, parsley, and apple I think) and I nearly gagged. So awful. It tasted like liquid celery, and I like celery. So that has made me a little apprehensive. I totally have been wanting to juice but I can’t bring myself to pay that kind of money for the machine! Furthermore, I still need to do some research on it all: juicing with a proper machine takes out all of the fiber that’s in fruits/vegetables. Is it better to have a “juicer” like the nutri-bullet that keeps in all of the fiber or should you buy a REAL juicer that really just leaves the juice for you to drink? My girlfriend has recently started juicing. I have been thinking of adding water to make it go a little further and cut some cost. p.s. limes add some great flavor! Hm, can’t say I’ve really ever gotten the juicing craze! We have a blender we make use of for shakes/smoothies a lot, though. Whatever makes you happy is worth it I say! Hey, I didn’t think of it that way. I like the way you think! I’ve never tried juicing vegetables – I love fruit juices, but not sure how I feel about bok choy juice or carrot juice! It seems that it’s given you guys some health benefits though, so that’s a big plus. For myself, I probably wouldn’t consider getting a juicer until I had more space. We have smoothies every morning for breakfast and I also juice. In fact today I have a batch of veggies to do. I love it. It is so good for you and a great way to get extra nutrition in. I am so glad to hear you guys are eating meat free. You are going to feel so much better in the long run and the planet and animals will thank you. If you want a tasty recipe, try two golden delicious apples and one third of a fresh lemon. Best lemonade ever!! Your post is so timely — my husband and I have been sucked into health-related documentaries on Netflix, too. We just watched “Vegecated” and I’m seriously considering going Vegan, though I think baby steps toward vegetarianism is my best bet. I’m so glad to hear you enjoy your juicer because I’m considering getting one — my boss brought his to work one day and made juice out of carrots and green apples. That’s it; two ingredients and it was delicious! I appreciate that juicing isn’t the most frugal approach to grocery shopping but let’s be honest — the health benefits are out of this world and will keep you out of the doctor’s office and hospitals later in life, which is a HUGE money-saver. I try to save money whenever I can but I do not believe in buying cheap, processed foods just to save a buck. Please post some of your favorite veggie/fruit juice recipes — I’d love to try them! We have not eaten meat since we watched Vegucated. That was our breaking point. We were heading vegetarian anyway…but that was the straw that broke the camel’s back! I have juiced at least once a day since I bought my juicer, sometimes twice a day. I feel amazing! Add a few apples to anything and it tastes amazing! Let me know what kind of juicer you are thinking of getting. It is totally worth the money IMO!!!!!!!! Good to know! I guess it’s like making smoothies — I stop adding stuff once it tastes good! How interesting that Vegucated had the same impact on you guys as it did me; glad I’m not alone! Thanks for a great post and I’ll be sure to update you on my juicing endeavors. We have a lot of half eaten carrots and stuff like that since my little kids never eat everything on their plate! I try to make the “base” of the juice out of less expensive stuff. I am going to write an updated juicing post soon!